What front anti-roll bar do I want for Track Work? so my car is an '03 S.
I'm planning either LCA's or at least camber plates this year. A different thread made me start thinking about anti-roll bars. As I've been reading, it sounds like the factory roll-bar is the right one for the rear. But what's the hot-ticket for the front? What should I be looking for? Sway bars are for tuning your car balance in corners and it is completely dependent on tire choice. The stickier the tires, the more sway bar you will tend to need. A car running square will need a more firm front bar to reduce oversteer. A car running staggered may want a firmer bar in the rear to reduce understeer and improve rotation. Picking out a nice new sway bar without careful consideration of tire choice is pretty useless. Makes perfect sense... but I guess I didn't realize we had that many to choose from. I sorta expected a "we all use XXXX, find one of them" sort of answer. I'm going to switch to NT01's this year. I haven't yet decided if I'm going to run Square or Staggered.... I'm leaning towards square, but I have wheels for staggered. I know people I trust in both camps.... so I'm struggling with the decision. Ultimately, this needs to remain a very street-user-friendly car. That's why I'm not going to do things like solid mounts / bushings, etc. (And when I go to Coil-overs next winter, I'll probably do the R&T's, because without exception, everyone I know who has done so has indicated that, while it made the car better on the track, it also made it better on the street. I have not heard the same things said about other brands of coilovers.) Sway-bars shouldn't hurt my ride-quality on the street, so I'm adding 'em to the "when I get to it" list. I'm running the Tarett GT bars, got them to try and reduce the body roll I got on the M030 OEM suspension (to try and help with tire edge wear) and I kept them on when I replaced the M030 with PSS9. I've only had 1 event on the PSS9 and it was at a brand new track so I don't have any comparison, but I'm going to Sebring this weekend so I will have some data after that. Other combos are the Eibach matched set with adjustable rear bar, and H&R has a set of matched bars. I have heard that some spec Boxster folks that run square use the GT3 bar in front combined with the OEM bar in back, or else set the front GT bar very stiff, and the back very soft. I also know two people (myself and another person) that ran into the following issue when running our aftermarket bars at full soft. My fried tried to run his Tarett rear bar at full soft, and somehow tore up a CV Boot. I'm not sure how that happened, but that was his report. So just be aware of the geometry and check when the suspension is loaded. So I don't have a "We all use XXXX" but I will say, make sure to get a matched set! Last edited by steved0x; 12-06-2018 at 10:12 AM. I run tarretts full soft in the front, and one off full soft in the rear. Car is pretty damn neutral with not much body roll, but I also run spec boxster spring rates. i'd say it depends what your ultimate goal for the car is. I left it in the front middle/rear 2nd to softest with my change to PSS9 (with stock PSS9 rates) and one of my friends with this same setup runs his bars the same way. I'm still feeling out this new setup, and will keep it this way at Sebring (I'd rather start with more understeer than oversteer) but when I go to Roebling in January, I think I am going to soften the front bar by one hole. At Roebling you live and die in the mid corner phase of all the long sweepers, and the understeer really hurts you there, so looking forward to trying a new softer front bar setting there to see what happens. Steve, it was not your error. I have to run the rear Eibach bar in the center hole because of that issue. I use the stock drop links. My "issue" right now is having to fight understeer when I'm pushing hard, towards the second half of a session. Maxed out on front camber, so my choice now is camber plates or LCAs since I'm not really liking the square setup. Not sure camber plates will give me enough (-2.5 to -3.0) in the front (even with my lowering springs). And LCAs are darn pricey, anyone tried the SPC adjustable control arms? Last edited by steved0x; 12-07-2018 at 05:48 AM. I run the Elephant Racing control arm. Not sure why this isn't more popular with the non Spec class folks. No shims are necessary. Infinitely adjustable caster, and fully rebuildable by the end user. I had camber plates in the front already so I kept them - and I'm running -3.5 in front. As for the front bar, it's a GT3 bar with Tarret extended drop links, and a Tarret rear bar with their links as well. Last edited by rastta; 12-07-2018 at 06:35 AM. The easy answer is the 996 GT-3 front adjustable front (from Porsche or Tarett) and the Tarett rear adjustable sway bars. On the softest settings they will be 50% stiffer in front and 30% stiffer in rear as compared to the stock S model suspension. The good thing is that they can be adjusted as you improve your suspension components (coilovers + springs), improve tires (NT-01), and improve as a driver. As others have noted, the suspension has to be viewed as a total package - everything works together. Optimizing one characteristic (like roll stiffness or damping) won't yield huge benefits if other characteristics are still lacking (like camber). Thus, the biggest bang for the buck is camber. Without enough camber, it kind of won't matter what else you do. Camber is intimately related to tire choice and driving skill. The stickier the tire and the better the driver, the more camber. After camber, then the car needs stiffer springs and improved damping. Then fine tune the roll stiffness. You're talking about these at $1200? It says they need to be used in conjunction with their camber plates, another $650. Are these really that much superior to these from Pelican, for instance? Or these from RENNLINE for $850? serviceable ball joints? you don't want to throw away a $1000 control arm because the ball joint wears. adjustable thrust arm bushings? big camber pushes the control arm out and impacts caster (especially at the front where the thrust arms are shorter). monoball or rubber bushings? how much play do you want in your suspension? adjustment mechanism - shims are extra $. 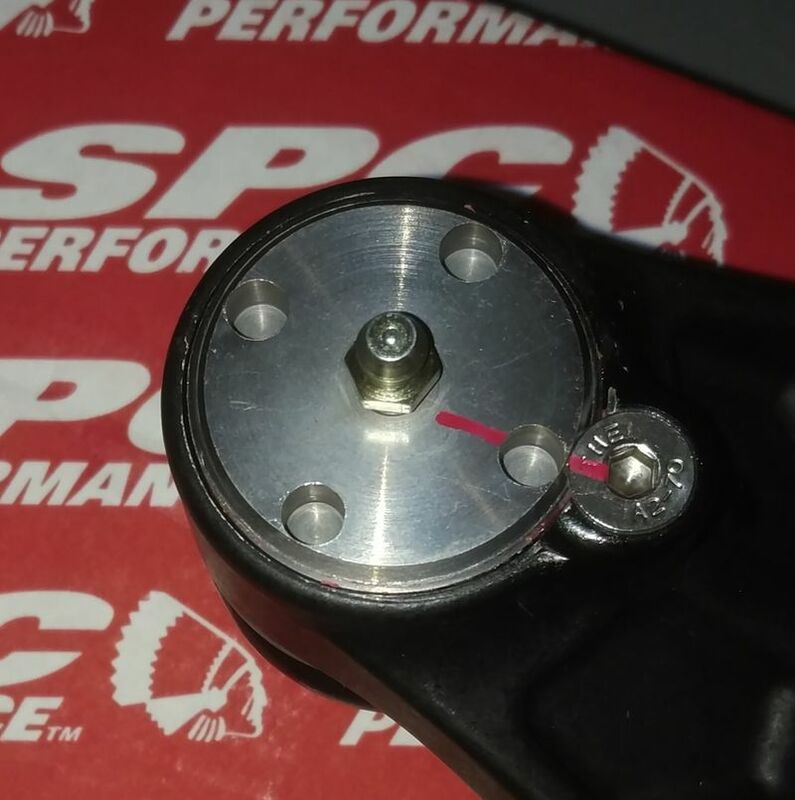 quality - do you trust spc after what steve went through? ps, note that the rennline arms are $600 a PAIR, but the ends are $250 EACH ($500 a pair) so the rennline product is $1100. with the elephant product for the addnl $90 you get solid thrust arm bushings, serviceable ball joints, and a simpler adjustment mechanism. Last edited by The Radium King; 12-07-2018 at 09:06 AM. Why does elephant's description say I need to use their camber plates as well? if you are looking for camber you shouldn't need camber plates - the lcas should be sufficient. if you are looking to widen your track, then they would be required to keep negative camber from being too much. i did speak w the elephant guys and their lcas have 25mm of adjustability (max on oem gt3 is around 19 mm i think). so, the idea is you use the lcas to widen the track (ie, no wheel spacers required) and use the camber plates to adjust camber afterwards. just keep an eye on caster as you push the lcas out. Both of the above arms are far stronger than the elephant stuff - compression on threads, really. compression strength won't be much different than tension strength, hey? presume more than adequate for the application (threaded fasteners are designed for tension). i'd be more worried about the shear strength, however not much opportunity for a shear load in the application. You're saying GT3 Factory, right? Not 986 Factory? Right?